Diet. This is a word associated with weight loss. People follow all kinds of diet like a low-carb diet plan with the intention of losing weight. However little do they know that there’s no point in just following a diet. Each individual’s body reacts differently to different types of food to give different results with different diets. Public health guidelines generally recommend following a diet which ensues your body receives sufficient vitamins, minerals and nutrition. In addition to this, they advise burning more calories than you consume to lose weight. And then there are healthy foods which you should include in any diet like vegetables, whole grains, fruits, seafood, low-fat or fat-free dairy products and lots of water. You are also advised to reduce your intake of sodium, Trans fats, saturated fats, refined grains and added sugars. You know all this, but the question is you don’t know how much of each food is good for your body. Various factors determine your individual requirements like body stature, height, weight, waistline and metabolic function. Besides, your present health condition determines your diet. 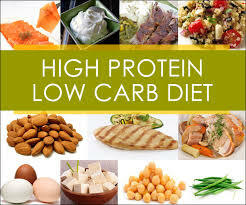 Basically, instead of a low fat diet, a low-carb diet plan gives better results in your weight loss endeavors. This is because it’s always better to follow a diet where you avoid eating simple refined sugars and junk foods and instead, eat only complex carbohydrates, starches and fiber. Most of the overweight or obese suffer from metabolic syndrome and have an increased risk of developing type-2 diabetes and heart disease. Metabolic syndrome is associated with an increased waist circumference, reduced HDL (good cholesterol) levels, higher blood sugar and insulin levels and higher blood pressure and triglycerides levels. A low-carb diet plan can help treat and prevent metabolic syndrome. In fact, it not only helps with weight loss, but also leads to improved health in many ways. It has been proven that people suffering from metabolic syndrome suffer from carbohydrate intolerance or high levels of insulin and insulin resistance. They experience exaggerated glucose and insulin response on ingesting too much carbohydrates. As glucose uptake by their body muscles is impaired, ingested carbohydrates are diverted to the liver and converted to fat. This elevates triglyceride levels and triggers lipid problems. A low-carb diet plan generally involves totally avoiding refined sugars, candy and beverages and avoiding carbs like bread, potatoes, rice, pasta and corn and increase your protein consumption. . The only carbohydrates permitted in limits are those found in fruits and vegetables. To compensate, you need to increase your consumption of natural healthy fats to provide for your body’s energy. So increase your consumption of dairy, animal and plant derived fat while avoiding low-fat dairy products as they contain artificial sugar. After following this diet for some time, you need to slowly and selectively add carbohydrates to your diet so that you don’t start gaining weight again. Like any medication or diet, consult your doctor and ask for their advice before you start a low-carb diet plan. It’s also better if you know someone who has tried the diet as they will know about any diet pitfalls. Record your blood pressure, blood sugar and blood lipids once before starting the diet and again 3-6 months later to compare and note the difference in readings and your general lifestyle and health!